CORNELIUS TRAAS IS a farmer on a mission to get children eating more fruit and vegetables. 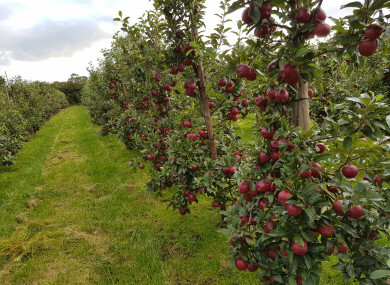 The south Tipperary farmer is based between Cahir and Clonmel and this year marks a quarter of a century of his free apples to schools project. Traas grew up on the apple farm and as a child his parents would send him and his brother into school with box of 30 apples for their classmates. It began when I was in primary school more than 40 years ago. My parents gave me [and my brother] a box of apples to distribute to our classrooms at Halloween and this continued through secondary school. Traas said it was their way of marketing, what was then a relatively small business. Maybe they were trying to make sure we were popular in class. The tradition died when Traas and his brother left home, and wasn’t revived until he decided to return to the farm over two decades ago. By that stage a classmate of his had become a teacher in a local school and on his return they got to talking about days of old. Traas decided it would be nice to get the tradition going again, and over the last 25 years he’s given local schools approximately 120,000 apples. I work with 32 schools across south Tipperary and give out about 6,000 apples each Halloween. Traas said he has a “particular sentiment towards healthy eating” and wants to do his bit to encourage children to build good habits. Fruit and vegetable consumption is nowhere near where it should be in Ireland. We’re only eating about a third of what we should. Having worked with Bord Bia previously, Traas said he knows that seeing other children in class eating healthily will encourage other pupils to do so too. If there’s a child in class who would never have touched an apple, well seeing their classmates trying them out, it would hopefully encourage them to give it a go. Traas said only about five percent of the apples we eat in Ireland are Irish and he’d like to promote locally produced fruits through this project. I think it’s a fabulous project, our pupils don’t have access to as much local produce as they should. He said it provides a valuable learning opportunity for pupils to talk about where food comes from and healthy eating: “the children get to see the different types of apple”. It gives the teacher a huge opportunity to promote nature, healthy eating and local produce. It creates a good talking point around climate change and even science projects. Email “Tipperary farmer gives away 120,000 apples to local schools in a bid to promote healthy eating ”. Feedback on “Tipperary farmer gives away 120,000 apples to local schools in a bid to promote healthy eating ”.